JOHANNESBURG, South Africa— Nations around the world today voted to formally ban international trade in pangolins, the small, scaly anteaters that once inhabited vast stretches of Asia and Africa but are now threatened with extinction. A shocking 1 million pangolins have been removed from the wild in the past decade, making them the world’s most trafficked mammal. Photo Courtesy Tikki Hywood Trust. Photos are available for media use. Today’s decision was made at the 17th meeting of the parties to the Convention on International Trade in Endangered Species (CITES), a treaty ratified by 182 nations. In listing all eight species of pangolins on “Appendix I” of the treaty, the CITES agreement officially banned all international, commercial trade in pangolin products, including whole scales, powdered scales and meat. Import and export for scientific purposes will still be allowed. 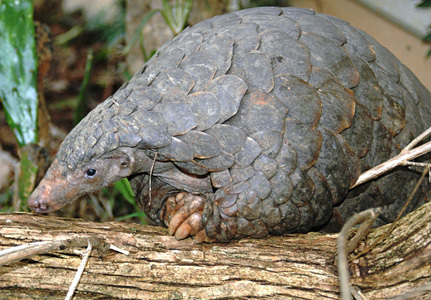 Pangolins are small, ant-eating mammals covered from tip to tail with large, geometric scales. But one of their most appealing behaviors — pangolins roll up into near-perfect balls when threatened — makes them easy for poachers to bag. Unfortunately pangolins are in high demand. Their meat is considered a delicacy, and their scales are erroneously believed to have curative properties by some practitioners of Asian medicine. Roughly 100,000 pangolins have been removed from the wild each year to meet this growing demand, causing dramatic declines in their populations worldwide. Without CITES protections, pangolins might have been poached to extinction in the coming decades. In 2014 the Center and its partners formally petitioned the U.S. Fish and Wildlife Service to protect pangolins as “endangered” under the country’s Endangered Species Act. Although most illegally sourced pangolins are destined for markets in China and Vietnam, there is demand for pangolins in the United States, where at least 26,000 imports of pangolin products were seized between 2004 and 2013. The United States was a strong proponent of today’s international protections. While today’s vote still requires a final vote of approval next week, the decision is unlikely to change.